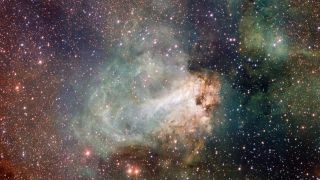 In this cool space wallpaper, the first released VST image shows the spectacular star-forming region Messier 17, also known as the Omega Nebula or the Swan Nebula. This vast region of gas, dust and hot young stars lies in the heart of the Milky Way in the constellation of Sagittarius (The Archer). The VST field of view is so large that the entire nebula, including its fainter outer parts, is captured — and retains its superb sharpness across the entire image. The data was processed using the Astro-WISE software system developed by E.A. Valentijn and collaborators at Groningen and elsewhere.